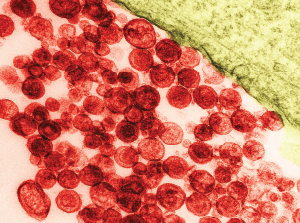 Particles of human T-lymphotropic virus 1 on a transmission electron micrograph. The virus has been implicated in lymphoma development. A 57-year-old Ghanaian woman was referred to our rheumatology practice with acute, left elbow swelling and pain. The referring oncologist suspected gout, because the patient had hyperuricemia. Prevalence of Gout and Hyperuricemia Increase in U.S.
Six months before, the patient was diagnosed with stage IV human T-lymphotropic virus type 1 (HTLV-1)-associated adult T cell lymphoma (ATLL). Her initial oncologic manifestations included multiple thoracic, abdominal and retroperitoneal masses. Biopsy of an abdominal mass showed histological and immunohistochemical features of T cell lymphoma with CD3 positivity. Serologic assay and Western blot were positive for HTLV-1. The patient had osteoblastic lesions of the skull, and axial and appendicular skeleton, including bilateral distal humerus diaphyses. She developed a pathologic fracture of the right mid-humerus that was treated conservatively. Chemotherapy was started with CHOP and methotrexate. The patient initially had significant clinical and radiologic improvement in the right humerus fracture, abdominal masses and lymphadenopathy. However, at the end of the treatment, she developed right facial numbness, with radiographic evidence of progression in the calvarium, and was started on whole brain radiation therapy. She was a poor candidate for more aggressive chemotherapy, because she was a Jehovah’s Witness and declined blood products. At this time, the patient also reported new, left elbow pain and was referred to the rheumatology clinic. At the initial rheumatology evaluation, the patient described one month of worsening left elbow pain, without any other associated symptoms. The exam was significant for a warm and swollen left elbow with limited extension. Her other joints were not swollen or tender. She had no palpable tophi. Her uric acid level was 12.7 mg/dL. An X-ray of the left elbow did not show fracture or lytic lesions. Ultrasound demonstrated a large, partially compressible, anechoic to hypoechoic Doppler-negative collection in the left elbow joint, anteriorly and posteriorly (see Figure 1, & Figures 2 & 3). On longitudinal anterior humero-radial view, a continuous hyperechoic line was present over the hyaline cartilage of the humeral capitellum, which raised suspicion for a double contour (DC) sign (see Figure 1). On anterior transverse view, this linear band was also visible, but was more suggestive of an interface sign (see Figure 2). Joint aspiration revealed hazy serous fluid, with 1,200 red blood cells, 3,900 white blood cells (21% leukocytes, 6% lymphocytes and 73% monocytes) and no crystals. On cytology, a large number of abnormal lymphocytes were seen, compatible with malignant effusion from the patient’s lymphoma. A repeated joint aspiration for additional synovial fluid for immunofluorescence and flow cytometry was planned, but unfortunately, two days later, the patient acutely decompensated, transitioned to comfort care and declined further procedures.